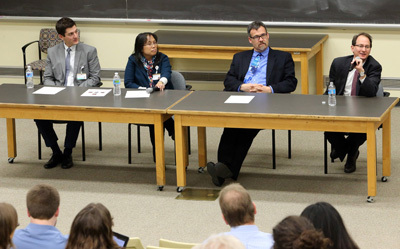 The question of what’s different about pragmatic research was aired in a well-attended panel discussion last week in Light Hall sponsored by the Vanderbilt Center for Health Services Research and the Mid-South Clinical Data Research Network (CDRN). No longer an obscure concept, pragmatic research has gained currency in recent years. Introducing the topic, moderator Russell Rothman, M.D., MPP, defined the pragmatic clinical trial as a trial whose purpose is to inform decisions about practice. “In general, pragmatic trials are trials embedded into usual clinical care as a way to test the effectiveness of interventions in real world clinical practice,” said Rothman, professor of Internal Medicine, Pediatrics and Health Policy and principal investigator for the Mid-South CDRN. In contrast to explanatory trials, which use restrictive criteria and strict protocols applied by selected providers to cordon off any confounding variables, pragmatic (or effectiveness) trials use broad inclusion criteria and broad provider participation and tend to be flexible concerning protocols and follow-up, and their results apply to the population as a whole. Rothman provided examples of actual pragmatic research questions: What is the optimal dose of aspirin after a heart attack? What is the best new oral anti-coagulation therapy for atrial fibrillation? What is the role of improved hospital discharge processes to prevent readmission? What is the role of educational interventions to promote medication adherence? “You’re really trying to see, if this intervention was going to be taken into the real world, into usual care, how would things work,” he said. There are several different types of research that the CDRN can help support. “We can help investigators who want to look at de-identified data for observational research, so if you want to look at big data across multiple clinics or hospitals, we can help with pulling that data together,” Rothman said. Clinical Fellow Michael Noto, M.D., Ph.D., recounted a Vanderbilt pragmatic trial published recently in the Journal of the American Medical Association, which found that bathing critically ill patients with disposable chlorhexidine cloths didn’t decrease the incidence of health care associated infections when compared to less expensive non-antimicrobial cloths. Rowena Dolor Cuff, M.D., MHS, associate professor of Medicine at Duke and adjunct associate professor of Medicine at Vanderbilt, spoke about engaging and supporting the participation of clinics, clinicians and patients in pragmatic research. Todd Rice, M.D., MSCI, assistant professor of Medicine, spoke about Internal Review Board oversight and regulatory issues surrounding pragmatic research. For more information visit the Mid-South CDRN website.